When you are casting your vote this November, remember what Great and Envied Americans were. You need a leader this time who has policies so he can effect to repair domestic needs and dealing fairly with our allies. John Edwards has such a domestic policy (read it for yourself on his website) [her link, not mine]. See also that he will effect a program which will repair our own great works of art and commerce before there are more bridges falling into troubled waters (The Worlds of Anne McCaffrey). While I have avoided making to many political statements this year, I agree with all of the problems she outlines for the US both foreign and domestic. I am not sure that I agree with her endorsement, but my vote is still up for grabs. Her endorsement is very well reasoned. With so much at stake in the coming election, it is good to expose ourselves to as many points of view as possible. I hope we can heal the wounds in our nation, and repair our image oversees. 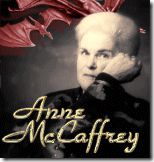 On that, at least, Anne McCaffrey and I agree.